Great fondue is truly amazing, and although it may be intimidating, it really isn’t all that hard. The recipe my family uses is perfect so I’ll retype it out and add in some tips. -Get some great dippers and other sides to snack on. Some you don’t want to dip because they’ll either fall apart or change the flavor of the fondue, but you can just drizzle the cheese on top…Here are my favorites: 1/2 in. to 3/4 in. cube day old bread, chunked salami, green apples, pears, cauliflower, grape tomatoes, chunked ham, roasted tomatoes (don’t dip), sautéed mushrooms (don’t dip), broccoli (don’t dip), baby gherkins (don’t dip), marinated peppers (don’t dip) and I’m sure I’m missing some gems but that will do for now. -Grating cheese, cutting bread (& prepping other dippers) are the bulk of the work, so put those kitchen-novices to work because this is one recipe where many can help out. -don’t worry if the consistency looks a little thin…test it by dipping a piece of bread to see if it coats it and you get enough cheese on there. It will continue to thicken as you eat it too. Rub insides of a 4-quart heavy pot with the cut sides of the garlic (and discard remaining garlic). Add the white wine and bring to just a summer over moderate heat. Stir together cornstarch and kirsch in a cup. Put aside. Gradually add cheese in batches to pot and cook, stirring constantly in a zigzag pattern (not a circular pattern) so the cheese does not ball up, until the cheese is melted and creamy. Do not let come to a boil. Stir cornstarch and kirsch mixture and stir into the cheese. Bring fondue to a simmer and cook, stirring until thickened, 5-8 minutes. Add freshly ground pepper. You can also add a dash or two of nutmeg while stirring (optional), but be careful not to over do it. 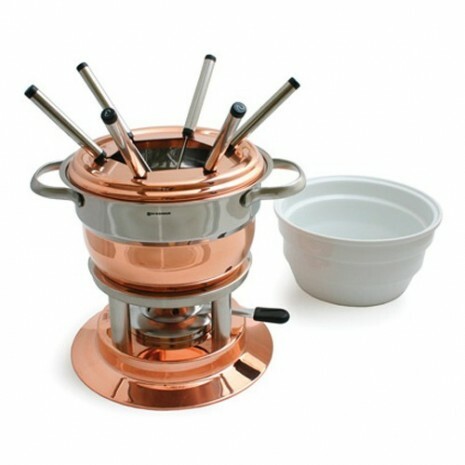 Transfer to a fondue pot set over a flame and serve along with your chosen dippers. It certainly is THE classic fondue. I love it. And, it was PERFECT for my birthday dinner. What fun, to share a fondue with so many dear to me gathered ’round the table — and all wielding long, sharp forks! THANK YOU, PS!